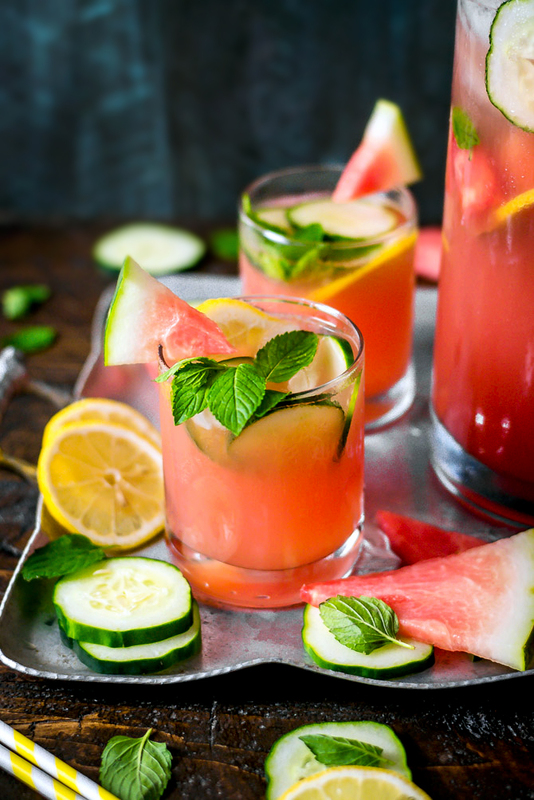 Boozy Watermelon Mint Lemonade. 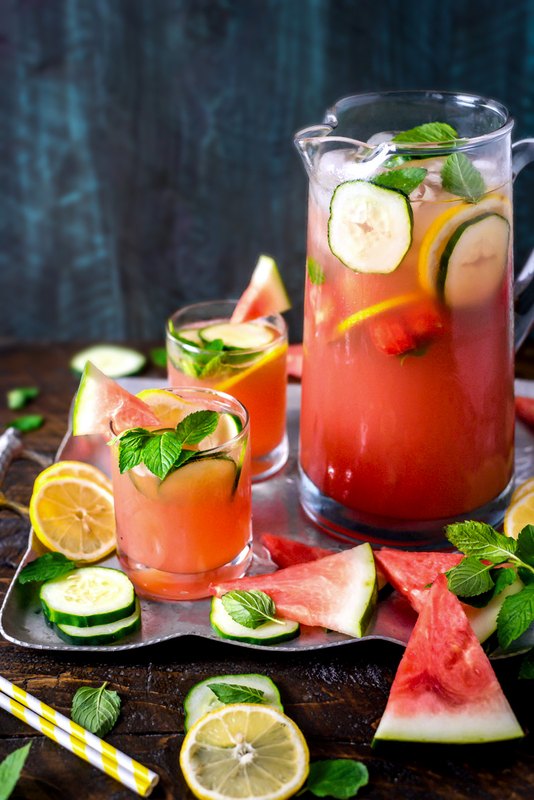 This super satisfying, refreshing cocktail is perfect for parties and cookouts. 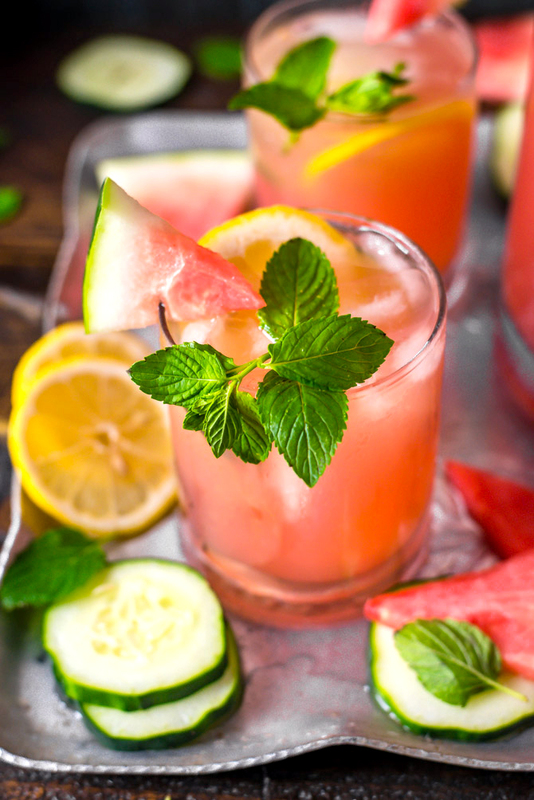 The combination of fresh watermelon, cucumber, lemon juice, and mint (with a little rum, of course) makes for a drink that screams summertime! I’m going to let you in on a little secret: even if you’re the manliest of manly, rugged, bearded, I-only-drink-straight-whiskey kind of man, you will smile like a giddy schoolgirl when you take a sip of this hot pink drink. That’s right, I said it. Feel no shame as the brightly colored sweet drops cling to your mustache; simply inform everyone that a hard-working man like yourself needs a nice refreshing drink in the brutal heat of summer as you’re out doing manly man things. Or whatever. And if you’re not a whiskey-drinking, crime-fighting, axe-wielding dude, then I probably had you sold on this drink the second you read the title of the post. Boozy. Watermelon. Mint. Lemonade. This is the Ryan Gosling of drinks, ladies. It’s a game-changer. It’s what love stories are made of. 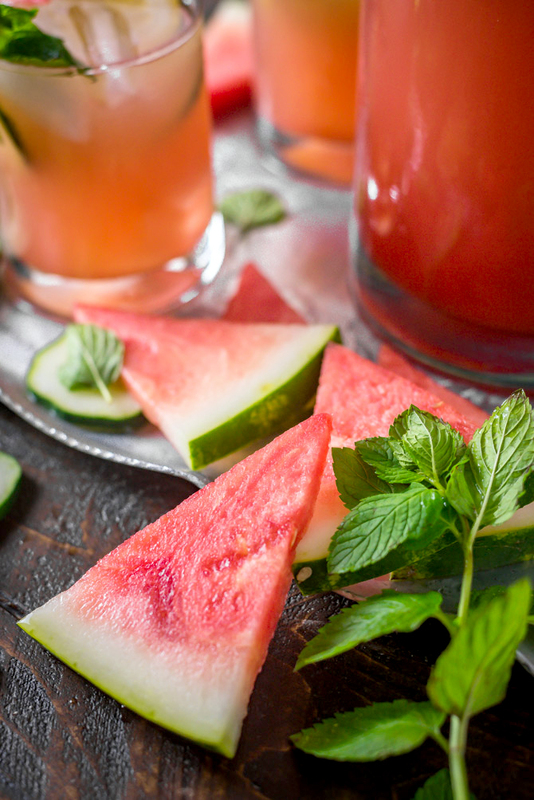 The main ingredient in this drink is fresh watermelon, which makes it a great candidate for a barbecue. Buy a big ol’ watermelon, slice up half for serving to the crowd (or use a ice cream scoop to scoop it out, like my family does). Then scoop the other half into a blender for your drinks. You get the best of both worlds and way less waste. I mean, it can’t just be me who always has leftover watermelon when I slice it up for a party right? There’s just too much in one big melon for everyone to eat, especially when there are burgers and dogs and salads to be enjoyed. 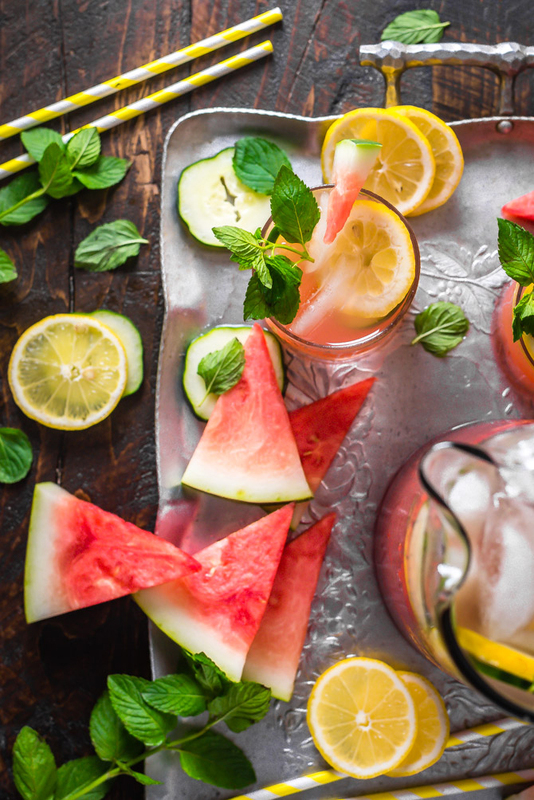 But there are never any leftovers when I make this Boozy Watermelon Mint Lemonade. Not of the watermelon, and definitely not of the drink. We all know that juicy, cool watermelon is mostly made of water (hence its name). That quality makes it very easy to puree into a base for the cocktail, and is unsurprisingly refreshing. 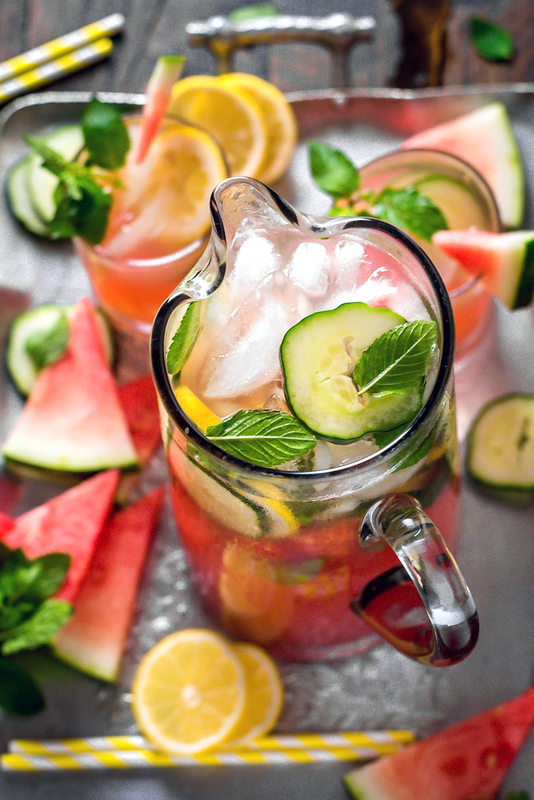 However, the secret ingredient that really amplifies that refreshing, melony appeal of the drink is actually a bit of cucumber thrown into the mix. But look, guys, it’s the day before Fourth of July, and when it comes down to it, we all know that the best way to celebrate is to enjoy a cool drink out in the sunshine with the grill going. There’s probably no need for me to keep rambling on to try and convince you– you’ve got planning to do, I’m sure. 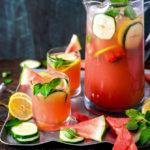 Still, I’ve got to throw in one more thing: You can make this Boozy Watermelon Mint Lemonade ahead of time and pour it into mason jars, screw on the lids, and serve them on ice at your next barbecue or get-together for grab-and-go cocktails. Simply shake them up and they’re ready to drink! Okay, okay, now I’ll let you get to mixing. 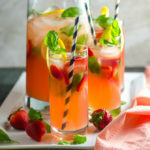 Easy to make and with only 6 ingredients, this refreshing cocktail will become a summertime favorite! 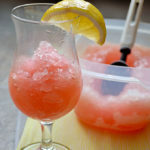 Put the chunked watermelon, cucumber, and mint in a blender, add the lemon juice, and puree until the mixture is smooth. Strain the mixture into a pitcher to remove the pulp and leaves. Mix in the alcohol or water and slowly stir in the syrup until everything is well-combined. Add additional syrup, if necessary, to desired sweetness. Add the lemon and cucumber slices and ice. 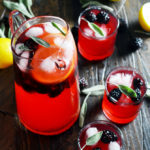 Garnish each glass with a sprig of mint. Serve. I believe it should be somewhere around 5 cups, but the “National Watermelon Promotion Board” (thank you google) says there are approximately 3.2 cups per pound, so that would be 8 cups. I’d say start off with 5 cups and add more if necessary. Thank you! 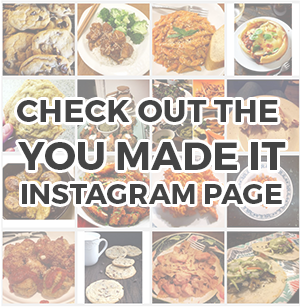 I made it last night for a party– it was a huge hit! Thank you so much:). And I cut up my whole watermelon, which was about 8 cups, maybe a little more. I had the small size jars (set of 12 from target), and I filled them with some leftover. Fabulous! Thank you! I’m happy to hear that you (and the party guests, of course) liked it so much! I guess the National Watermelon Promotional Board was right about that one– I don’t know why I thought I remembered there being so much less. 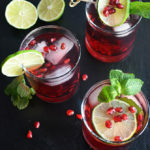 This drink looks delicious! I am planning on making it for a BBQ this weekend with a lot of people. How many drinks do you think this recipe makes? I’m wondering if I should double it. Caroline, I can’t remember exactly, but Lindsay, a commenter above, mentioned that she had enough to fill 12 small jars with some leftover. The recipe yields a lot of the drink (the huge jar and the two mason jars in my photos are all from the same batch, and there was a bit more leftover that I drank immediately… for taste-testing reasons of course) but if you’re having a very large party you might want to double the recipe or make one and a half batches. When you say agave syrup, where can I buy this? or simple syrup, what would that be? I would love to try this recipe!